Serving today’s mom requires a mix of offline and online creativity. Identifying an effective strategy is especially critical with the rise of the post-recession shopper. Instead of the traditional “retail therapy” of conspicuous consumption, today’s savvy mom proudly broadcasts bargains and savings to her entire network. The calendar reads 2015, but mom still uses the “smart shopping” skills she developed during the recession. “To entice them to come in, you have to have sales,” said Amanda Parker of New Hope Church Bookstore, Manvel, Texas. The path to purchase begins with the ever-present smartphone, commonly referred to as “mom’s third arm.” Parker has seen the impact. “When moms come in, they will have already looked up a couple items,” she said. Actively participating in this online conversation is labor intensive and beyond the reach of understaffed and overworked Christian retailers, but some retailers tap into the power of this network by posting images that showcase their family-friendly store. A mom scrolling through images would see a larger-than-life bounce house on the Facebook page of the White Wing Christian Bookstore in Cleveland, Tennessee. Rick Lewis of Logos Bookstore in Dallas says it’s not unusual for a photo with a cute baby to generate 100 “likes” on his store’s Facebook page. And nothing warms the heart of a millennial mom more than seeing a “next-gen dad” reading to a child on his lap. That’s the type of image that zips to the very heart of what matters to a mom. Social media has become a way to multiply and expand connections. Because moms live “from holiday to holiday,” Christian retailers need to keep that focus in mind and communicate about events or seasonal products, just as many general market stores do. Logos of Northern Kentucky in Alexandria uses Facebook to highlight special sales and local events that might interest customers. Parable Christian Store of Lima, Ohio, posts “Today only” sales bursts, as well as words of inspiration and encouragement. Although social media can boost store visibility and entice customers, encouraging mom to stay in the store can be a challenge. Busy moms “want to get in and out,” said New Hope’s Parker. And yet that length of engagement has a direct impact. Research shows that fully engaged customers spend three times more and are twice as likely to recommend a store to peers. To keep her engaged longer, stores must take the first step and offer a kid-friendly environment. Creating a family-friendly environment was the reason Kevin Ferguson chose to strategically reposition the entire children’s section from the back of Williamette Valley Christian Supply in Corvallis, Oregon, to the center. Providing that safe haven contributes to the trust relationship a retailer develops with moms, as child safety is her top concern. And the importance a mom places on safety extends to all aspects of retailing. For instance, Jackie Rubano at The Olive Branch in New Hyde Park, New York, deleted images of MOPS (Mothers of Preschoolers) members who didn’t want to be included in group shots on the store’s Facebook site. 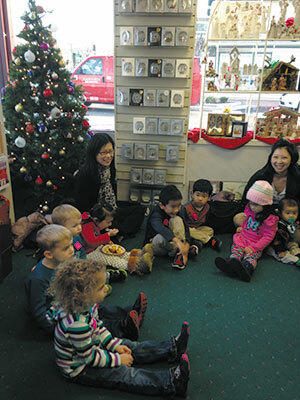 Hosting family-friendly events differentiates a store from online ordering and other competitors. But Logos’ Lewis takes that one step further, meeting mom where she already is—at her children’s school. The store hosts six to eight school book fairs annually. “We have to get out even more now because Internet shopping makes it easier for customers not to come in,” he said, noting that week-long book fair sales have ranged from $200 to $50,000 for the Logos store. School book fairs also introduce the store to members of the “momtourage,” who might be neighbors, grandparents and extended family members. However, not every grandma knows how to choose a good children’s Bible, so provide a list of developmentally appropriate gifts for children of different ages. This will help capitalize on the current shift toward community parenting, as mom can launch your store directly into her network. There’s still a woman inside every mom. Take a 21st-century approach and reach out to the whole woman while removing mom’s pain points. A thought leader in the children’s Christian marketplace, Mary Manz Simon holds a doctorate in early childhood education and is a best-selling author with more than 3 million books sold.